The blue nails are Kiss Me At Midnight, a Liquid Sand polish. It's a beautiful bright blue with silver glitter texture. Application was perfect. I used two coats. It did seem to take awhile to dry on me though. 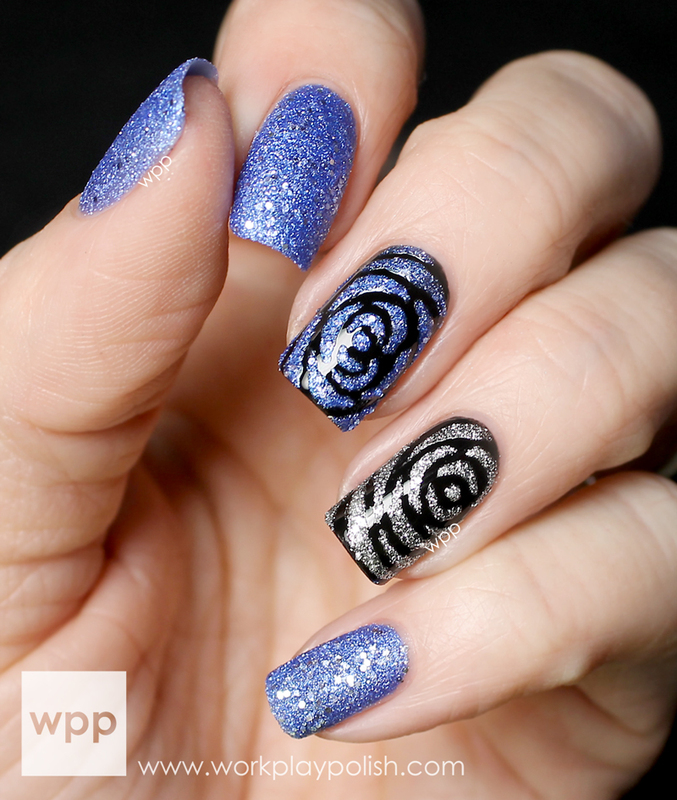 Which actually turned out to be an advantage when doing the rose nails. The black nails are OPI Black Onyx. I love how slick and shiny it is. On my middle finger, I applied Kiss Me At Midnight with a small nail art brush. I started with a dot in the center, then worked my way around, dabbing on increasingly bigger crescent-ish shapes. I used the same technique to apply It's Frosty Outside, a super blingy silver, on my ring finger. What do you think? I really like the black, blue and silver together! And the textured polishes are beautiful. Actually, I think five of the six Liquid Sands from this collection are must-haves. The OPI Mariah Carey 2013 Holiday Collection is available now at professional salons, including Beauty Brands, Beauty First, Chatters, Dillard’s, jcp Salons, Pure Beauty, Regis, Trade Secret, ULTA and ulta.com for $9.00 ($10.95 CAN) suggested retail for each nail lacquer. For more information visit www.opi.com, or follow OPI on Twitter and Facebook.